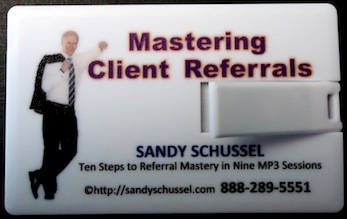 This LIVE recording of Sandy’s 9-week Teleconference Series will give you his 10-Step Referral System for getting clients that has already doubled and tripled the income of hundreds of financial advisors and insurance professionals who have put it to use. The approach is specifically designed to make it more comfortable to engage in referral conversations and to turn existing clients into willing partners in the referral process. $20 OFF* FOR FACEBOOK PURCHASERS ONLY…$39.00 plus FREE SHIPPING!!! or you can Download the entire audio immediately for just $37.00! For business people who want to attract more clients confidently and professionally, and not feel like that salesman on the used car lot with the bad hairpiece and the loud plaid jacket, this is the book to read! Become a Client Magnet is powerful, succinct, serious and, at the same time, light-hearted. You’ll find it visually interesting, and very easy to digest. 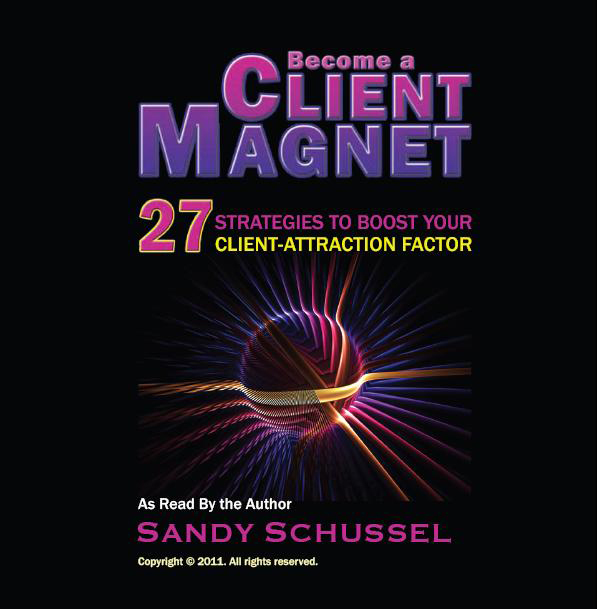 Sandy Schussel presents you with 27 Strategies to Boost Your Client-Attraction Factor! Read and integrate the simple messages in this book, and your business or practice will reach new heights of success. $11.95 (plus S/H). Free shipping with order of 10 or more copies. 15% discount (plus free shipping) on orders of 20 or more. Order copies for your whole team. As Read by Author Sandy Schussel! $14.95 (plus S/H). Free shipping with order of 10 or more copies. or Download the entire audio immediately, only $9.99! Also available as an eBook (Instant Download), only $5.99! Based on his personal journey and the 10-Step Program he devised for his clients to take action instead of making excuses, Sandy shows how fear can be insidious, pervasive, and ultimately, conquerable. 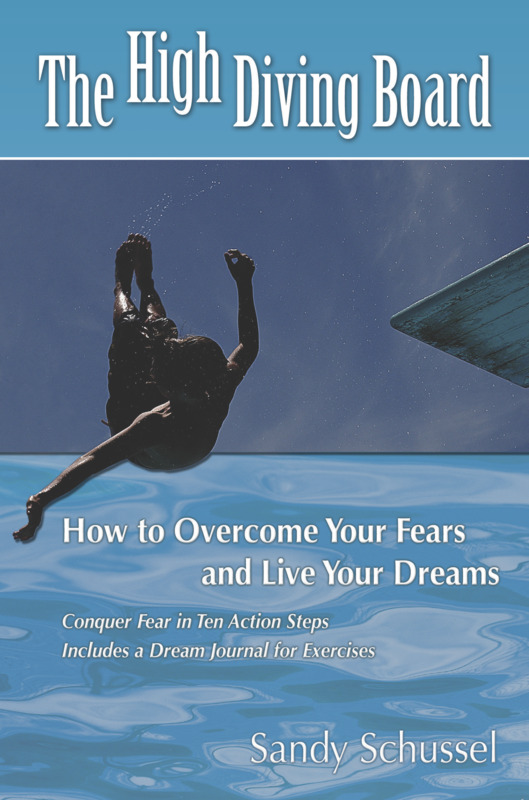 The book identifies the Seven Paralyzing Fears and includes a personal journal to help you commit to overcoming your obstacles and work through your 10 steps to reach your dreams. $17.95 (plus S/H). Free shipping with order of 10 or more copies. A step-by-step audio guide to living the life you want, by getting past the roadblocks and obstacles holding you back. Use it alone or in conjunction with The High Diving Board. *NOW AVAILABLE* as a Hard Copy CD!!! or Download the entire audio immediately, only $19.95! If purchased as individually priced, these books together cost $30.00. 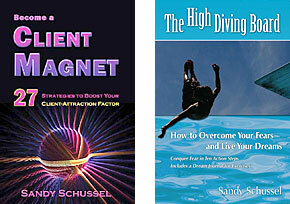 But Order THE HIGH DIVING BOARD and BECOME A CLIENT MAGNET together and SAVE…FOR WEBINAR ATTENDEES ONLY, BOTH for only $19.00 plus FREE SHIPPING!!! AUSTIN BAY PUBLISHING asked me to contribute a chapter to this book, which includes contributions from fifteen other people-some of the leading self-development experts in the world. The questions they asked were: What are the keys to success? What are the keys to happiness? The result is an extraordinary book. Order it here at a special pre-publication price with free shipping.